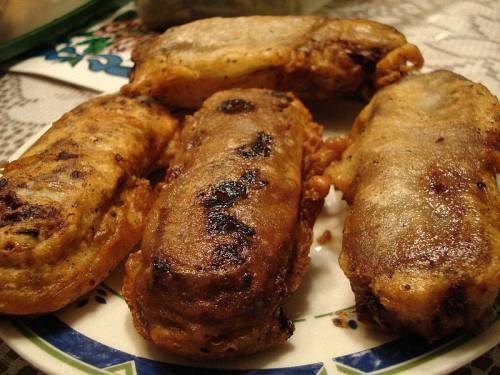 You simply must try this deep fried Mars bar recipe and see what all the fuss is about. Battered Mars bars originated at the Carron Fish Bar in Stonehaven, Scotland where they began as a novelty treat. Now, they're a Scottish delicacy, and you'll find them being sold in takeaway fish and chips shops in Edinburgh, Glasgow, and other places throughout the country. Battered Snickers bars and Bounty bars are also available, but the battered, fried Mars chocolate bars tend to be the overall favorite. While you wouldn't want to make a steady diet of them for the sake of your heart, a fried candy bar is something you must try at least once. A Mars bar or the chocolate bar of your choice can be fried in the same kind of batter used for frying fish and onion rings. It's strongly recommended that you first chill your bar in the refrigerator, but don't freeze it. After choosing your favorite batter recipe, mix the batter until it's creamy smooth and heat the cooking oil to around 360°F (180°C). Coat the chilled chocolate bar completely in the batter, then carefully lower it into the hot oil and fry until the batter is a deeply golden brown in color. It takes a few minutes. Remove from the hot oil and briefly allow the bar to cool on a wire rack, then serve while it's warm as is or with a scoop of ice cream or with whipped cream on top. Be careful, as the melted bar inside the batter is VERY hot! 4 ounces plain flour (1/2 cup), 1/4 pint (1/2 cup) of warm water, 3 tablespoons olive oil, a pinch of salt, 1 lightly beaten egg white. Sift the flour into a basin, make a well in the center and into this pour the olive oil; mix well, and add the salt, then slowly add the warm water, stirring constantly until the consistency of thick cream is obtained. Allow to stand for 2 hours or thereabouts, then stir in the lightly beaten egg white, and use as a coating for fish, or for fruits. This batter can be used for fish or onion rings, but when used with the deep fried Mars bar recipe above, you might want to half the amounts, unless you're planning to have fish and chips for the main course. 2 cups flour, 1 teaspoon baking powder, 1 teaspoon salt, 1 egg beaten, 1-1/2 cups water. Pour ingredients into bowl and mix or whisk to make a smooth batter. Try adding just a wee pinch of baking soda or vinegar if you prefer a lighter batter. This makes a simple water and flour batter for deep frying. My wife and I visited the ClamShell while sightseeing in Edinburgh, and we ordered the Mars bars fried in batter. It was fascinating to watch the friendly staff slip the bars out of their distinctive red and black wrappers, deftly dip them into the batter, and then deep fry them to a golden perfection. Extremely sweet and tremendously filling! Deep frying seems to intensify the sweetness of the chocolate bar. It was a tasty, crispy treat, but one serving was all I could manage. It was so filling. I ate mine around 1:30 pm, and I wasn't hungry again until breakfast the next morning. One will definitely satisfy your sweet tooth! Deep fried candy bars are not the only fried foods loved by the Scots. 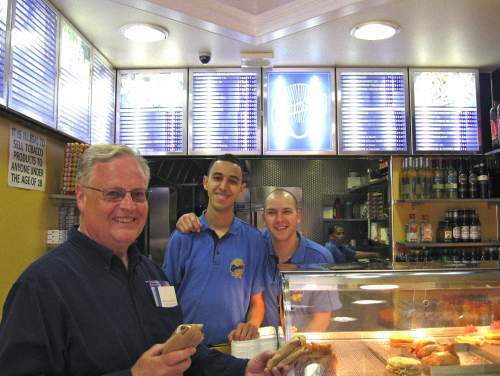 It's not difficult to find a chippy where cheeseburgers, pre-baked pizzas, haggis puddings, black puddings, pineapple rings, bananas, ice cream, and even pickled eggs are dipped in fish batter and deep fried to a crispy delicacy. 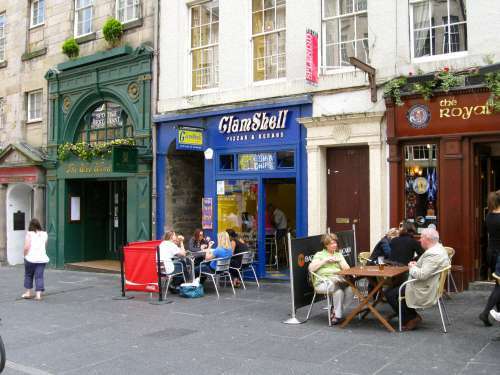 The ClamShell Fish and Chip Shop is at 148 High Street on the Royal Mile, just a few doors east from St. Giles' Cathedral. Be sure to visit it when you're in Edinburgh. The "Battered Mars Bar" costs only £1.70 at the time of writing. The battered fish with chips with mushy peas is said to be excellent at the ClamShell, but their "Braveheart Pizza" (cheese, tomato, haggis & onion) or the "Haggis with Chips" are choices that I would really like to try when next in Edinburgh. I can't help it, folks, I love haggis! The young ladies in the above video are unknown to us, but they are clearly enjoying their battered Mars bars at the ClamShell on the Royal Mile. Until you can visit Edinburgh and try this Scottish delicacy for yourself, use the deep fried Mars bar recipe above to make your own. You'll love them! Mars®, Bounty® and Snickers® are trademarks of Mars, Inc.